Here's a very good starter eyepiece that won't break the bank! 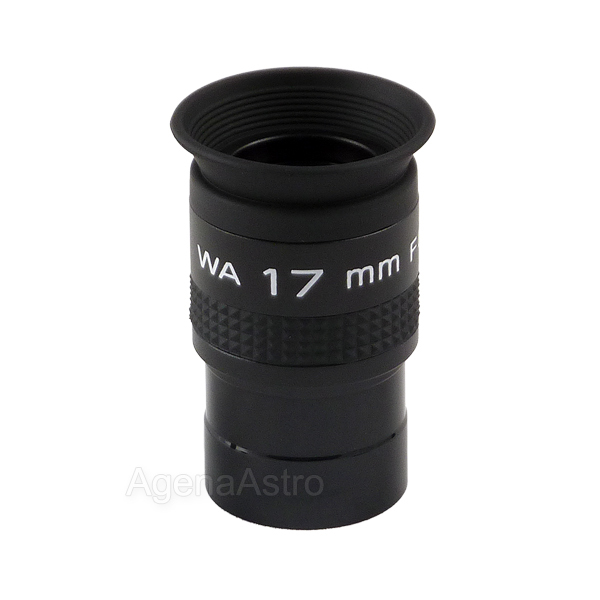 With a 1.25" barrel and 17 mm focal length, this compact and lightweight eyepiece gives bright, crisp, and wide-angle views of the Moon, planets, and deep-sky sights with any telescope. High-index glass with broadband multi-coatings enable a wide 65 degree apparent field of view with excellent color correction and minimal image distortion. Blackened lens edges and anti-reflection threads ensure maximum image contrast. Viewing position can be adjusted with fold-down rubber eyecups. Made from black anodized aluminum, and the base of the barrel is threaded for standard 1.25" filters. To minimize the need for refocusing, this eyepiece is parfocal with other eyepieces in the same series. 4.3 (Based on 6 Reviews) 83% of reviewers recommended this product. I am using a 60mm f/800mm refractor in an attempt to see all the Messier objects from my suburban back yard. This eyepiece gives me a 1.25 mm pupil size, which puts the light levels in a good range to identify planetary nebula and other dim objects. Definitely a good eyepiece in this application for the money. Review by dude of California. Great view of the moon with my f/8.5 refractor at 35x. Wide enough angle so the moon can drift but still stay in view for a while. Not so good in my f/4 reflector though. Review by Markus of Canada. Bought this Sept 2015. Tried it in my 10" F/4.7 reflector. Lots of astigmatism, but was to be expected for the price point. It had a nice sharp-looking field stop, and it played well with filters. Eye relief was pretty good. If you want this for pinpoint stars across the field, make sure you have a long focus scope. If you want this for filter use, I recommend it. Not bad for the money! Review by rd726 of Indana. Have had nicer, but for the money this eyepiece is a VERY good deal!! Review by Jamie of Tennessee. You can't find a better wide view eyepiece for the price. These have provided me with some of the best views yet in my 6" F/8 Newtonian as well as my 10" F/5 Dob. You can't go wrong with this series. I have a 660mm focal length scope, and this lens sets up perfectly for me - 39X and about 1.7 degrees field of view. Not finicky about eye placement, and has decent contrast. Very good for the money.